Select & Download the free custom feed usage, production and other forms for use in the barn, coop, or pen. To add a new production item click on "+ Add New", to edit click on "Edit". The production entry screen will display. Production Date (Required entry) Select the date of production. 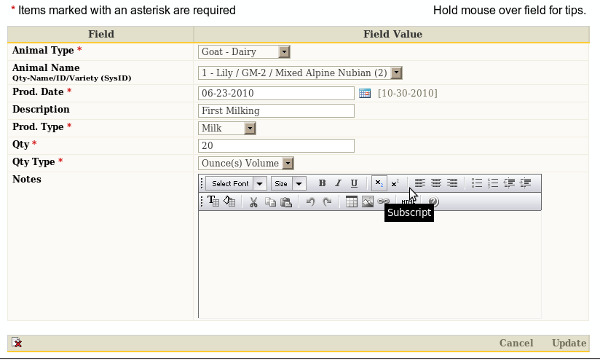 Description (Recommended entry) Enter descriptions such as weekly total, first milking, etc... The maximum length of this field is 60 characters. Qty (Required entry) Enter the quantity of the type specified in the "Quantity Type" field. In the example (above) 20 ounces are entered. Qty Type (Required entry) Select the type of quantity measurement.